At Eastern Oregon University, the fees that each student pays are broken down into 5 major categories. Incidental Fees, also referred to as Student Fees are a portion of money collected from students to give back to different student groups. These dollars are allocated by students that sit on the Student Fee Committee (SFC) who serve as representatives of the EOU student body. The purpose of these fees is to fund programs and activities which, in addition to the traditional academic elements of the University, further the cultural, educational, and physical development of the students at large. Where do my Student Fees go? The Student Fee at Eastern Oregon University is currently $255 per term for on campus students and $50 for online students. 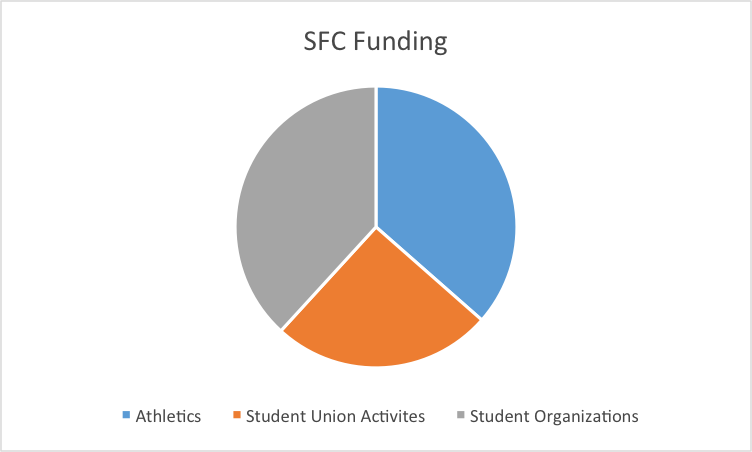 The SFC allocates approximately $1.2 Million to 14 different organizations on campus. To submit annually to the institutional president, with the approval of the ASEOU Senate written recommendations for the incidental fee charges to students for both academic year and summer session. To submit to the institutional president, with approval of the ASEOU Senate, written recommendations each year on the distribution of SFC income. To submit to the institutional president, with approval of the ASEOU Senate, written recommendations for budget increases or decreases and how they are to be distributed across the funded areas, according to whether the initial incidental fee projections each year are over- realized or under- realized. To submit upon request, to the ASEOU Senate or the institutional president (both orally and in writing) SFC’s assessment of how well the funding levels reflect the concerns and desires of the general student body. Recommend to the University President the budgets for those programs to be funded by Student Fees after obtaining as broad a base of student participation as possible. They help provide education and training not available inside the classroom. Student Fee Funded units allow students to expand their learning through action and organizing. All student group and activity budget are closely scrutinized to give quality programs to the University community. They help support student groups and their ideas.